With the launch of the Learning Academy and the plan we have to support local initiatives, there are now many benefits to becoming a member of the Pubilc Banking Institute. As a special offer, people who sign up for the Learner membership before April 19 can take the Introduction to Public Banking class for free. People who sign up for the Academy membership or higher by April 19 can take both the Introductory course and the more advanced Establishing a State Bank course for no additional charge. Member $50 – 25% off on courses and annual conference. Academy $100 – 50% off on courses and annual conference. Supporter $150 – 75% off on courses and books offered through PBI and on annual conference. Sustainer $250 – Free admission to the courses, 20% off books, and annual conference. Activist $500 – Free admission to the courses, 25% off on books, and annual conference. Founder's Circle $1,000 – Free admission to the courses, 30% off on books, and annual conference. Greenback $1,200 - Free admission to the courses, 40% off books and annual conference. Friend of PBI $5,000 – Lifetime free access to all PBI courses, plus 40% off books, free admission to all PBI conferences. Living Legacy $10,000 – Lifetime free access to all PBI courses and books, lifetime free admission to all PBI conferences. PBI is a project of Inquiring Systems, INC. (ISI), a 501 (c)(3) non-profit corporation. Tax ID number: 94-2524840. The address of our Fiscal Sponsor, Inquiring Systems Inc., for your records, is 21885 Bonness Rd., Sonoma, CA 95476. Donations to PBI are tax-deductible. 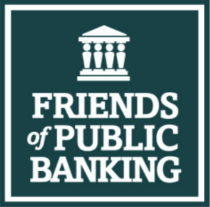 We are fortunate to have over 50 individuals and foundations step forward and provide more than $1,000 each to support the Public Banking Institute. The complete list is here. Thank you for your initial and continued support!